Apple’s new MacBook Pro laptop has won huge praise from tech writers since its launch in June at Apple’s Worldwide Developers Conference. The device’s high resolution (‘retina’) display grabbed most of the attention. The Guardian’s technology editor Charles Arthur admitted to being heartbroken at the thought of going back to lower resolution computers after returning his review model. 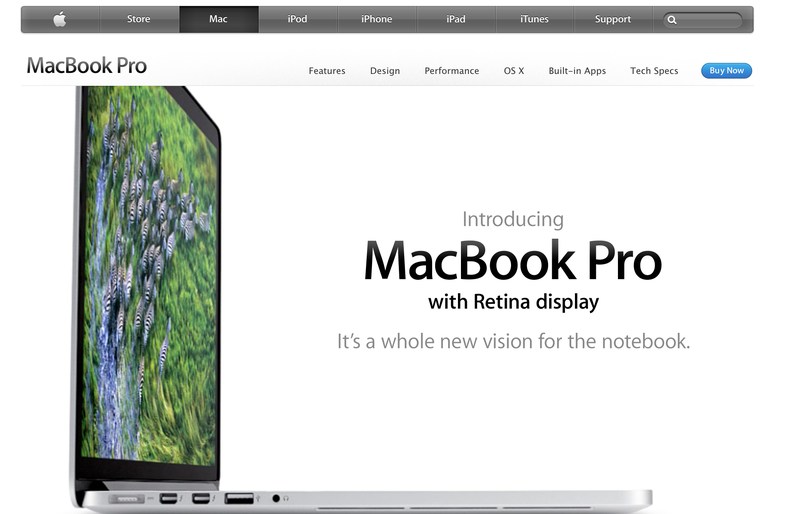 Apple’s marketing claims the MacBook Pro retina version is a new vision for the notebook. I think Apple is right – but not because of the display, gorgeous though it is. I bought my own retina MacBook a week ago. I love it with an intensity that I’ve not felt for a technology product since getting my iPad in May 2010. (Though my Garmin Edge 800 cycle computer comes very, very close…) It’s been a wonderful companion on our Cornwall holiday this week. I’ve loved watching and editing holiday videos and photos on it, as well as reading webpages. I didn’t expect to buy this particular MacBook. I’d long drooled over the MacBook Air, but was concerned that the Air would prove too slow for video editing. The latest Airs looked great – but the retina Pro looked even better. So it proved. But the retina MacBook Pro’s appeal goes further than the flash drive. It’s very light for a high-spec, 15 inch machine. Not as feather-weight as an Air, or some other laptops. But light enough to carry around for a day. This is a brilliant combination of performance and design. I’m very lucky to be able to afford this extraordinary computer. And the spec means I’m unlikely to feel the lack of upgrade options for a very long time. This entry was posted in Tech and tagged Apple, MacBook Pro retina by Rob Skinner. Bookmark the permalink.